This is the tips and advice section, add posts here to fill up your tips and advice section. Home security is still a priority for a lot of homeowners. But it looks a lot different now to what it used to. In years passed, extensive home security could leave your house looking more like a prison than a home. Now, though, you have access to more effective and less intrusive home security. And that’s all thanks to the advancing technology of home security automation systems. These systems essentially give you complete control over your home. They connect the various tech components of your home, and place them under your control through a singular operating system. And with everything from light switches to door locks under your command, your home security will be pretty high. If that sounds good to you, take a look at some of your options below. The centrepiece of almost all home theatres is a big screen. It’s the first thing you see, and often the most impressive. But it’s not necessarily the most important. What really distinguishes your home theatre from a TV room is the sound. And when it comes to sound, your choice of home theatre speakers is paramount. If you choose your home theatre speakers well, you will have a home entertainment system that is unparalleled! So take a look at our tips for choosing the right home theatre speakers, and road test them down at your local AV store. 7 Audio Visual Technology Trends To Watch Out For! For those of us lucky enough to have a home theatre room, the benefits speak for themselves. You get private viewing, relaxing space and the perfect wind-down opportunity – all in the one room. If that doesn’t sound appealing to you, we don’t know what will. 5 Must Have Home Theatre Accessories! Home Theatre Design and Installation: DIY or Hire a Professional? Why Choose a Professional for Home Automation Installation? Technology has advanced at a remarkable rate over the past decade and this has had a great impact on the convenience of home living. Today, almost all of your appliances are operated by remote control and with a wide range of connectivity options such as Bluetooth your electronics are able to connect with each other like never before. But how can this be used to improve the convenience and ease of living in your home? The answer is simple: home automation. Let’s face it; Brisbane’s making its move to the front of the pack when it comes to liveability. Chances are you’re waxing lyrical about the subtropical climate, beautiful surroundings and relaxed lifestyle to your interstate friends or family. It’s hard to see how home automation can possibly improve on what’s already so great about living here. But you shouldn’t write off home automation as irrelevant to your lifestyle or the stuff of bad ’60s spy films. Home automation’s come of age. Getting the right system for home automation in Brisbane will give you more time and the freedom to enjoy the sort of lifestyle you’re dreaming about. Best of all, it’s easier and more affordable than you might think. So you’ve decided you want to create your own media room. You‘ve picked the perfect spot in your home to set up your home entertainment hub and you’re ready to go. But wait! Before you start refurbishing, be sure to avoid the common mistakes people make when creating a media room. These relatively simple errors can make or break your home of home entertainment! Luckily most of these problems have easy solutions. Having trouble making Netflix work on your older model TV? Don’t worry, there are easy answers! Netflix is quickly becoming the new norm for the average Australian household. This Internet streaming media allows for TV and movies anywhere, anytime. Never again will you have to wait for your favourite TV show to come on. If you don’t have a Smart Television though, you might be wondering how to watch Netflix on TV. Home automation. Unsure of what it means? Okay, imagine this. You roll in after a hard day, tired and weary, ready to sit down and tune out with a few hours of tube. You need to close the curtains, turn on the sound system connected to the TV and turn the TV itself, after getting a drink and a piece of fruit. Not everybody loves going to the movies. Finding a park, allocated seating, the line at the snack kiosk, the loud mouths and the chompers…and that’s before the movie starts. When the lights go down, you’re treated to a great flick in the discomfort of decade old seats, where other butts have sweated and the arm rest is usually broken. Occasionally, you’ll buy a popcorn and a drink, but only after saving your spare change for a month; going to the movies almost demands a second mortgage. If only there was a way to get the widescreen experience at home…home theatre is just that. The widescreen experience in the comfort of your own space, where the snacks are fresh, the popcorn hot and you can have a beer without sacrificing a week’s worth of coffees. AirPlay, allows wireless streaming of video, audio and photos. Developed by Apple, both third party manufacturers and Apple can include the technology within devices, including Yamaha and other devices. 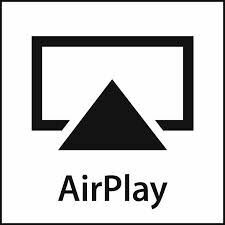 AirPlay sends AV content, or receives the content and recreate it through sound systems and TVs. Any device running iTunes, such as iPads, iPods, iPhones or Mac computers running a new iOS or greater. Airport express is for audio only and Apple TV works for both sound and vision. If you have Apple TV, you can wirelessly stream what’s on your iOS device to your speakers and HDTV via your Apple TV. You can even display what’s on your mobile device to the big screen. Your favourite movies, holiday photos and even sports — Apple TV and AirPlay put it easily on your TV. AirPlay Mirroring lets you show exactly what’s on your iPad, iPhone, Mac, or iPod touch screen to everyone else in the room. Show games, photos, web pages, videos, presentations, spreadsheets, and more on your HDTV via Apple TV. You can rotate from portrait to landscape zoom in and out and your audience will see that too. By selecting the “Multiple Speaker” option you can have your tunes playing in the kitchen, bedroom and living room or anywhere you have speakers installed, and as it works over Wi-Fi, it’s easily streamable from your home network. Simply connect to your home network, and you’ll be streaming tunes through your entire house, instantly.